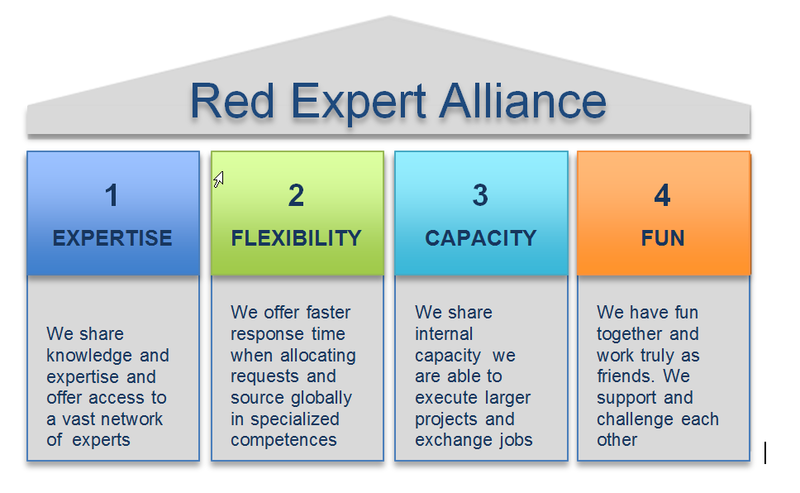 RED Expert Alliance (REAL) celebrates its first year as a community of collaborating Oracle Expert Companies. It is time to review the accomplishments of this alliance and emphasize the power of collaboration. The alliance is initiated by Robbrecht van Amerongen, manager at AMIS. His vision is to create a community where knowledge sharing, project capacity planning, flexibility in the application of expertise and fun came together. The alliance is designed with a culture of collaboration, mutual trust and transparency in mind. The aim is to deliver optimal solution and services to our customers and increase the international exposure of our own services and our contacts with the Oracle organization. The alliance is founded in September 2014 and now, one year later, it is time to review everything we have accomplished so far together with all member companies: AMIS, AVIO Consulting, Acando, LINK Consulting, OPITZ CONSULTING, RUBICON RED, RITTMAN MEAD, ATSISTEMAS. We created a community of 8 companies who represent about 900 expert Oracle Specialists from all over the world. A monthly checkup call for all community members discussing openly commercial, technical and resource matters. Sharing knowledge and best practices amongst each other. In the field of User interface frameworks, cloud implementations, Oracle Strategy, Integration platforms, customer interaction. Being able to offer our customers quick access to training material through easy sharing of training material amongst REAL Partners. The community acts as a sounding board for a wide variety of technical and resource challenges and produces solid, innovative and flexible solutions for individual partners. Mutual resource sharing among partners of the REAL alliance to offer a flexible capacity for our customer projects. Share each other’s products, reference implementations and best practices. Among the partners and also with our customers. Be a sounding board and place for feedback for Oracle Product management regarding the development of new versions of Fusion Middleware solutions. Make use of each other’s marketing channels to promote events, best practices and knowledge sessions. Close collaboration between partners in specialized fields to supplement each other’s expertise. Numerous allocation questions between partners for short term specialized resources and long term capacity requests. Share knowledge and practical experiences on the usage of Oracle Cloud products, in order to guide us in the right direction for best practices and avoid pitfalls. Sharing ideas for technology sessions. Partner community gatherings in Portugal and Bucharest. Cross share blog posts, white papers, presentations and other relevant content. As you can see, the power of collaboration is beneficial for our customers, for the REAL Partner companies and for the individual employees of the REAL community. Our focus on our customers’ solution and delivering optimal solutions in new and innovative technical environment makes it obvious and imperative to collaborate with our peers. And while we are improving ourselves, we are having fun doing so. We are looking forward to the upcoming year of collaboration.